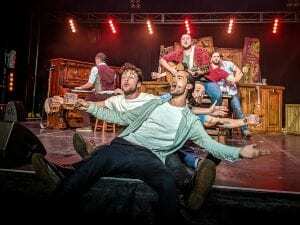 The cast of Choir of Man comes from the UK to recreate a London-style pub and to sing with audience members in an interactive and exciting performance. Photo courtesy: Mount Baker Theatre. From social media to Pokémon Go, we’ve begun to craft (and perhaps expect) an interactive world. A world in which we are given permission, even encouraged, to go beyond simple one-sided responses (such as clapping or clicking “like”). A world in which we have grown to expect that response generates a response in return. We want to create our own worlds. And entertainers are helping us get there. Choir of Man draws participants into the show by inviting some onto the stage for a pint and a good time. Photo courtesy: Mount Baker Theatre. Everyone seems to be in on it. Netflix recently debuted a Black Mirror episode, Bandersnatch, which promised unique interactivity in the form of a storyline in which the audience determined the ending. Mount Baker Theatre is no newcomer to this trend, after bringing Broadway musical Once to Bellingham. This show’s stage featured a working pub where patrons might be a part of the scene and buy a pre-performance drink. If that idea captivates, see below for more interactive theater fun that includes – what else? Beer! In a digital world, this level of interactivity is becoming increasingly normalized. But even in more traditional settings, such as the theater, some performers are looking to build interaction as a way to drive their entertainment forward. And they’re capturing fans in the process. Given the trend, MBT has doubled-down, offering a trio of interactive events for the 2019 season. Choir of Man offers a musical feast with pub tunes, folk, rock, choral and operatic numbers, and more. 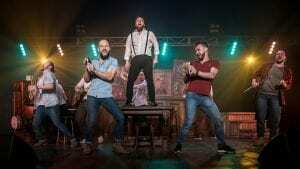 These nine incredibly talented men hail from the UK, bringing us contemporary music with an enduring, popular appeal alongside tap dancers, tumblers, singers, instrumentalists, and even the reigning BBC UK Poetry Slam Champion. The production features music from Adele, Queen, Paul Simon, Guns N’ Roses, Broadway tunes, pub songs, folk music, and everything in between. The troupe harmonizes, dances and stomps together as they draw out the best in any audience looking for a fantastic time. 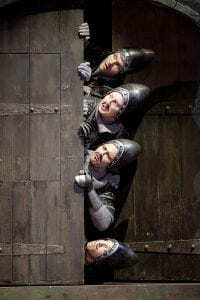 Knights hunt for the Holy Grail in Eric Idle’s Spamalot. Photo courtesy: Mount Baker Theatre. 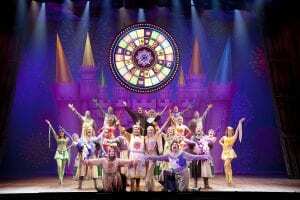 Spamalot is an outrageous, hilarious comedy-musical mash-up written by former Monty Python actor Eric Idle that brings on the belly laughs. A Monty Python and the Holy Grail spoof, Spamalot is a Tony Award winner for Best Musical that features a hunt for the Holy Grail set in the fall of 2018 with music and lyrics by Grammy-winning team Eric Idle and John Du Prez. “Holy Gales of Laughter! A Holy Grail of a big crowd-pleasing musical!” said Newsday. Interactivity? Cast members have been known to draw audience members into the action, but saying more may spoil the fun. Reports have it that Eric Idle is working on the script for an upcoming movie version, so the time to see the stage version is now. 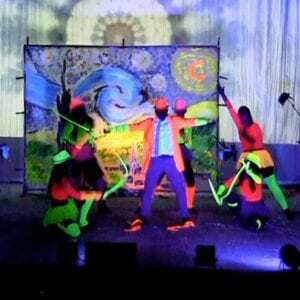 Artrageous deploys a variety of fun and exciting techniques including blacklight to draw the audience into the performance and the art. Photo courtesy: Mount Baker Theatre. What if an artist could create a masterpiece before your eyes? Artrageous draws on art, music, theater and passion as they combine visual art with stunning vocals, intricate choreography and captivating music. Artrageous is an energy-filled romp through the artistic fields with heavy doses of inspiration, creativity and participation. This troupe of artists, musicians, singers and dancers pay tribute to a variety of forms, icons and musical genres throughout the exciting evening, which culminates in a tourable gallery of finished paintings. Each show is as unique as the audience, so be prepared to become part of the event and help create something special. Troupe members mingle and interact with patrons, inviting their own sense of inspiration. The touring group of Spamalot brings a classic favorite to life through larger-than-life musical numbers. Photo courtesy: Mount Baker Theatre. This show is ideal for anyone looking to be inspired, connect to creativity or feel the wonder of art as an experience rather than an object. So whether you’re looking for inspiration or a brew, laughing until you ache or songs to sing along with, MBT is satisfying our need to become part of the action. And don’t worry, if you prefer less interactive entertainment, all of these events can simply be watched. But if engaging is your thing, MBT has you covered in 2019. Tickets to all of these shows and more can be found at mountbakertheatre.com.